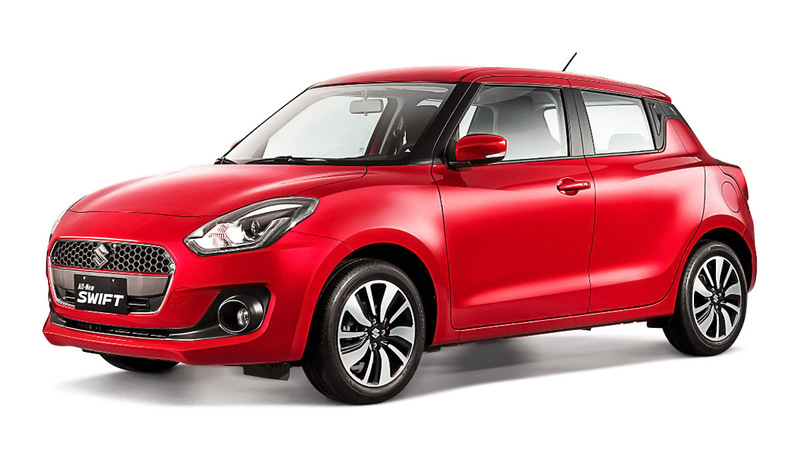 It’s the all-new Suzuki Swift. 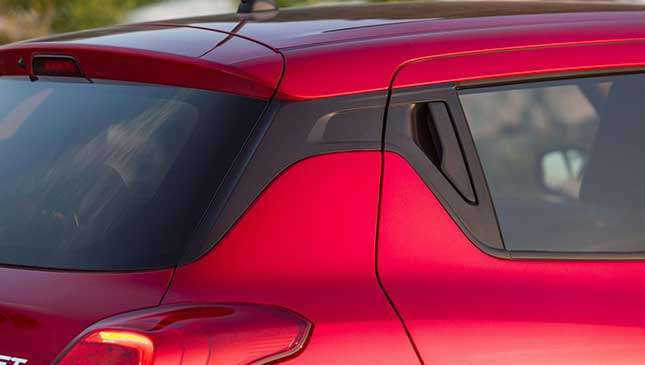 You get some classic Swift design features, like the wraparound windscreen and the sloping roof, plus distinctive C-pillar treatment that now has a ‘floating roof’ effect. Even the light clusters front and rear aren’t that much different to the old car’s units, although the ‘smiling mouth’ lower front grille is not going to meet with universal rapture. 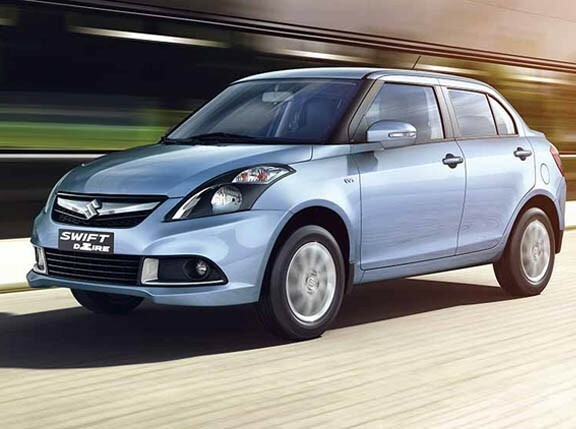 Nevertheless, the Swift is smaller (10mm shorter, 15mm lower, although 40mm wider) and considerably lighter than its predecessor, and it sits on the company’s ‘Heartect’ platform, used for the Ignis. But a 20mm stretched wheelbase means there’s plenty of space within and a cargo area that’s bigger by 54L than the old car. Two engines, the 1.2-liter Dualjet normally aspirated four-cylinder petrol and the much more charismatic 1.0-liter Boosterjet three-cylinder motor do the donkey work, and both of them can be mated to the Smart Hybrid Vehicle by Suzuki (SHVS) system; this doesn’t add anything in terms of outright torque or performance, but it does marginally cut the emissions and gives the combined economy a little tickle upwards. The 1.2 SHVS is also an Allgrip 4x4 model, while the 1.0 SHVS is the only Swift that comes with the option of an automatic transmission. So, what’s it like behind the wheel? So far, we’ve only driven the 1.0 Boosterjet SHVS manual. This little Swift churns out 109hp at 5,500rpm and 169Nm from 2,000-3,500rpm, all going to the front wheels via a five-speed manual gearbox. Performance is punchy enough to have us excited at the prospect of the Swift Sport. 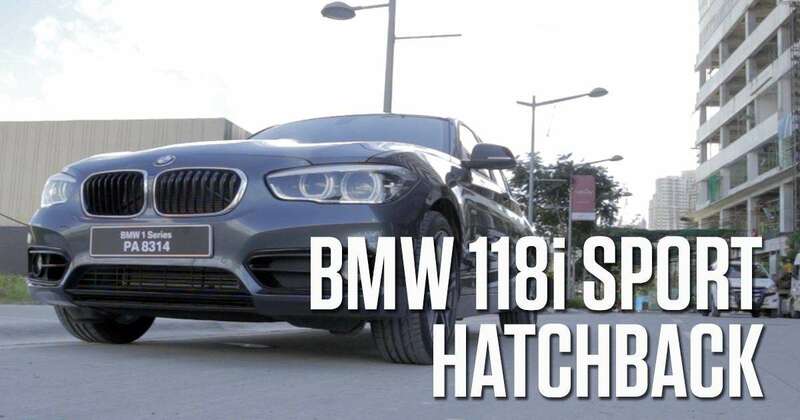 The 1.0-liter’s 0-100kph time of 10.6 seconds and 195kph top speed feel like entirely believable claims. It’s a really perky little operator, the 1.0 SHVS, and while there’s the pleasing aural thrum to the way it piles on the revs, there are no vibrations or shudders to report back as you get quicker. 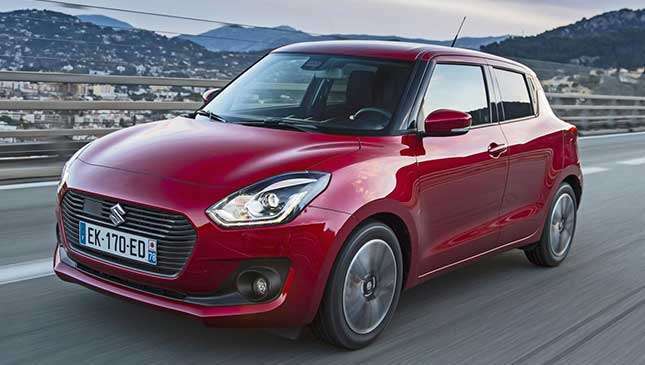 No problems with the motive power and no real problems with the rest of the dynamics, because—with the entire range weighing less than a ton and even as little as 890kg—the Swift feels lively and alert. The steering lacks for feel and the rack is controlled by a wheel that has a strangely thin rim, but there’s a distinct lack of understeer, well-managed body roll, and a real eagerness to flick-flack through direction changes. That speaks of purposefulness that’s at odds with the Swift’s cutesy face. The ride is comfortable, and there’s little to report in terms of wind, engine or tire noise when you’re on a steady-state cruise. We wouldn’t say the 1.0 is an absolute firecracker to drive, or anything that should be on someone’s bucket list, but as a really cultured, appealing supermini, this Suzuki mild hybrid is up there with the best in class. Less impressive. There’s a token effort at funkiness, in the form of contrast fillets of trim on the dashboard and running around the door handles, while the pattern of the cloth seats seems to be some sort of subliminal marketing ploy to encourage you to trade up to a Mercedes one day. Other than that, it’s lots of sturdy, charcoal-gray plastics and fairly simple dials and surfaces. So it’s not exactly breathtaking inside, but it is all well laid-out and intuitive, and there’s plenty of space on-board for four adults, although five might be pushing it. Furthermore, like any self-respecting Suzuki, the equipment levels on the Swift are generous almost to a fault. Even the base variant has air-conditioning, six airbags, DAB radio and Bluetooth as standard, while higher trims enjoy smartphone link infotainment, a rear-view camera and other items like 16-inch alloys and front fog lamps. The top variant, close to what we drove, gains climate control, satnav, rear electric windows and adaptive cruise control, among much more. 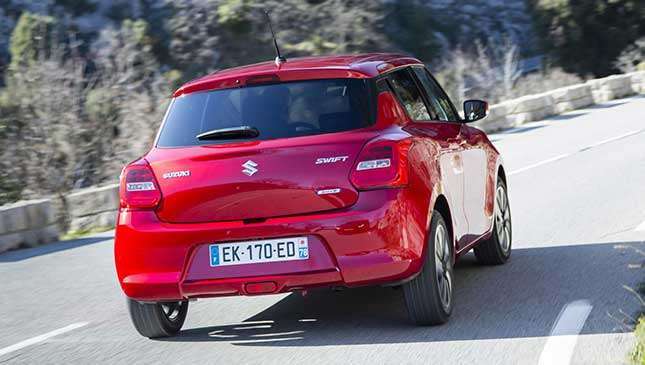 Good news all round here, as we’re thoroughly impressed with what we’ve seen of the fourth-generation Suzuki Swift so far. 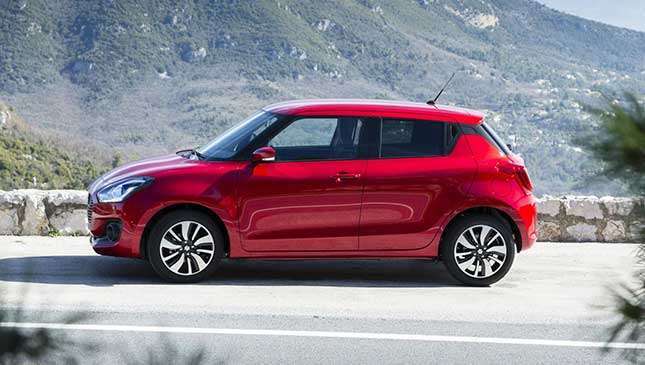 It’s neatly styled and really intelligently packaged, what with its weight loss program and small dimensions teaming up with improved cabin space, while the fabulous 1.0-liter Boosterjet engine with the mild hybrid assistance leads to a Swift that admirably lives up to its name. You don’t have to work this Japanese hatchback hard to get it to build up a good head of steam and, once the corners start coming thick and fast, it’ll hang onto as much of its pace as possible, thanks to a limber chassis with an excellent set-up. 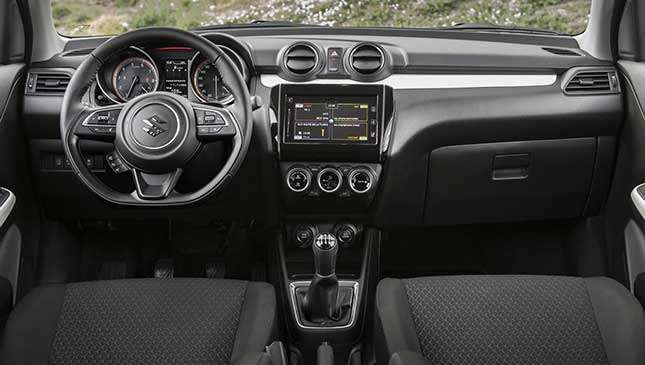 Factor in Suzuki’s generosity when it comes to interior equipment, and it’s clear the Swift should be on many buyers’ shortlists. This is a fantastic little car from a company that’s becoming fast known for such things.